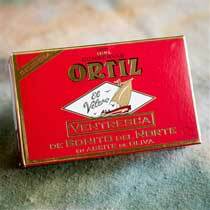 Established in 1891 by Bernardo Ortiz de Zarate of Vizcaya, Spain, the world-renowned Ortiz seafood company is today still operated by the family's fifth generation of food artisans. 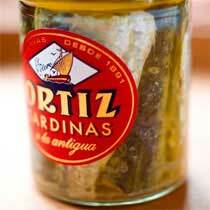 Conservas Ortiz takes painstaking care over the origin and freshness of every fish prepared. 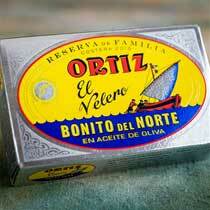 The Ortiz family upholds the traditional methods upon which the company was founded over 100 years ago: local fishermen use pole lines to catch, one-by-one, the prized Bonito del Norte (Atlantic white tuna) and nets for classic Basque anchovies. 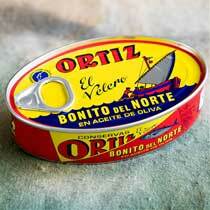 Ortiz has perfected the balance between employing modern techniques to achieve greater quality while maintaining a scrupulous respect for tradition - particularly traditional fishing techniques to ensure that the fish are properly handled and sustained, improving the flavor and texture of the final product. 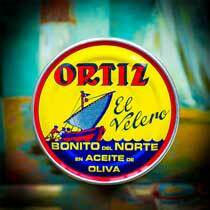 Ortiz seafood is known as "Delicacies of the Cantabrian Sea" and is procured around the globe by the most discriminating tuna eaters. Conservas Ortiz dates back to the 19th century. After the death of Lázaro Nafarrate in 1850, his daughter Higinia Nafarrate married Antonio López de Aréchaga, leading to the birth of a child called Petra López de Aréchaga Nafarrate. Years later in 1891, Bernando Ortiz de Zárate, the founder of Conservas Ortiz, married Petra López de Aréchaga Nafarrate; soon, they had a son, José. 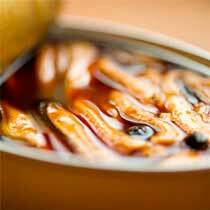 Bernardo learned the trade from his brother-in-law and started work in the fish canning industry. 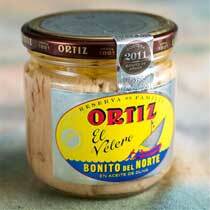 He bought anchovies and white tuna - bonito del norte - on the docks from the fishermen, and taking advantage of the possibilities offered by marinating and wooden casks, he sold the fish throughout the northern Castile region the following day. In order to make the company as efficient as possible, he invented and created a system of factories that operated during the fishing season. Bernardo died when José was still a child, and Petra ran the company for the next few years, when it became known as "Viuda de Ortiz" and then "Viuda de Ortiz e Hijo" (Widow of Ortiz and Son). 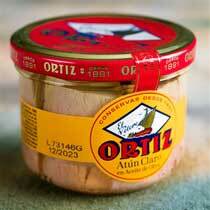 Canning techniques gradually improved and Conservas Ortiz opened five fixed plants, located along the coast of the Basque Country, Cantabria, and Asturias. 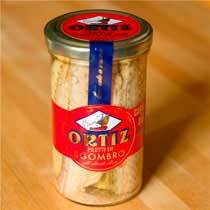 In 1942, José Ortiz and his son José Antonio Ortiz created the company that became Conservas Ortiz S.A. in 1956. The fifth generation of the family is currently managing the company. .